FILE - U.S. President Donald Trump departs to travel to New York from the White House in Washington. U.S. President Donald Trump said Wednesday that North Korean leader Kim Jong Un made "a very wise and well reasoned decision" to postpone a plan to launch missiles toward the shores of the U.S. territory of Guam. In a Twitter comment, Trump said, "The alternative would have been both catastrophic and unacceptable!" The North Korean leader was quoted Tuesday in state media as saying that he would, for the moment, call off the plan to fire four missiles over Japan into the waters near Guam, 3,400 kilometers to the south, to see "if the Yankees persist in their extremely dangerous, reckless actions." 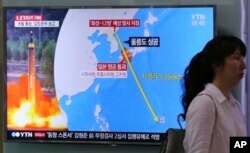 A woman passes by a TV screen showing a local news program reporting on North Korea's threats to strike Guam with missiles at the Seoul Train Station in Seoul, South Korea, Aug. 10, 2017. China, North Korea's economic lifeline and its only major ally, is telling Pyongyang and Washington that both should "hit the brakes" on the bellicose threats they have made against each other in recent days and weeks. Kim has boasted that North Korea has the capability of striking the U.S. mainland with a missile, while Trump says the U.S. would answer any attack with "fire and fury like the world has never seen." A day later, Trump said maybe his warning was "not tough enough." China said Foreign Minister Wang Yi on Tuesday told his Russian counterpart, Sergei Lavrov, that the two countries need to work together to curb tensions so that no one can "stir up an incident on their doorstep." "The most important task at hand is for the U.S. and North Korea to `hit the brakes' on their mutual needling of each other with words and actions, to lower the temperature of the tense situation and prevent the emergence of an `August crisis,'" Wang was quoted as saying. China quoted Lavrov as saying tensions could mount again next Monday when the U.S. and South Korea are set to launch large-scale military exercises. China and Russia both supported a recent U.S. move to approve new United Nations sanctions against North Korea that are aimed at cutting a third of North Korea's export income, $1 billion annually. The chairman of the U.S. Joint Chiefs of Staff, Marine Corps General Joseph Dunford, was in China and on Wednesday viewed a Chinese military exercise outside the northeastern city of Shenyang. Dunford said he told his Chinese counterpart, General Fang Fenghui, that Washington hopes diplomatic and economic pressure would convince North Korea to end its nuclear weapons development, but that it remains prepared militarily. "We hope for a peaceful resolution but we needed to seriously have a conversation about what might happen if there was military action," Dunford told reporters.